There is much excitement, by many. over the decline in the labor participation rate. They see it as some kind of signal that the economy is crashing. But why would the participation rate crash in this phase of the business cycle (the up phase), rather than for non-cyclical structural reasons? Is there some kind of new magical downward economic force that is preventing workers from finding jobs? Is it somehow causing the Fed to "run out of bullets"? Markets clear. thus, it is only when we are moving from the bull phase of the business cycle to the bear phase,that we see sudden cyclical jumps in unemployment. So what is going on now? Let's take a look at the data. 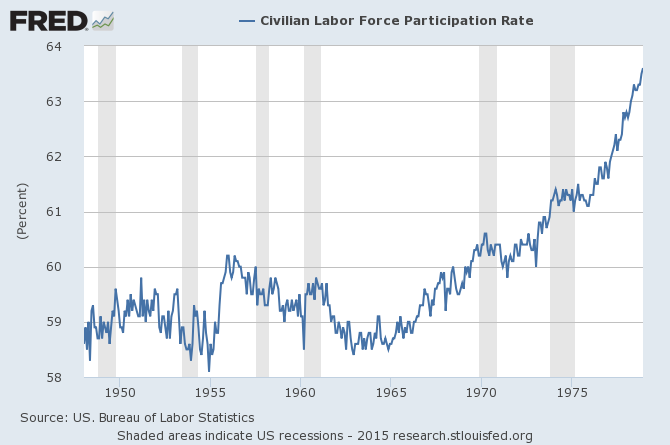 The participation rate in August 2015 (62.4 percent) is the lowest since October 1977. But the rate was lower than that every month between 1948 and 1978. The low point came in December 1954, when the rate was 58.1 percent. So if a "bad" economy isn't driving workers from the labor force, what is? 1) The aging of baby boomers. A lower percentage of older Americans choose to work than those who are middle-aged. 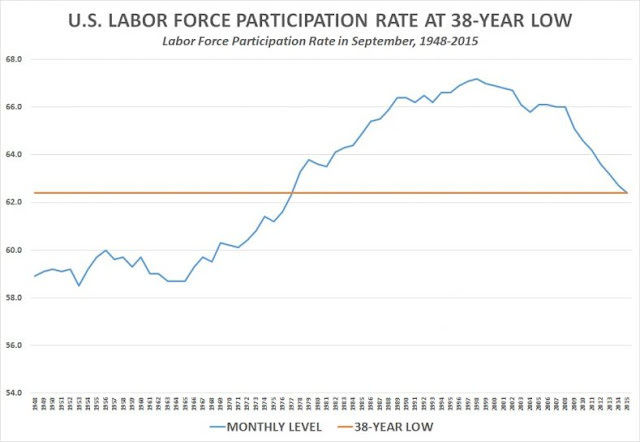 And so as baby boomers approach retirement age, it lowers the labor force participation rate. Almost all of the decline (80 percent) in the participation rate since the first quarter of 2012 is accounted for by the increase in nonparticipation due to retirement. This implies that the decline in the unemployment rate since 2012 is not due to more discouraged workers dropping out of the labor force. These studies fit with theory. Markets clear. In a boom cycle employment improves, if there is a climb in non-participation, it is for reasons outside the business cycle. If you don't believe this, you don't believe Austrian school business cycle theory. first time i'm ever disagreed with you. I don't get how you can say we're in a boom. In what aspects of the economy are we in a boom other than in the stock market and some real estate prices? You conveniently glossed over the 25-54 labor participation rate and the 55 and over rate which blows up all of your points pretty much by itself. You don't find it faulty to use BLS in 2006 before the 07-08 recession? what about the lack of small business formation? why are companies buying back stock instead of investing in itself and hiring workers to increase productivity? What about the fact the millenials generation is bigger than the baby boomers? what about the fact that the most common age in America is 24? QE has not worked, period, I believe I can believe in the ABCT without ignoring the fact we never left the 07-08 recession. 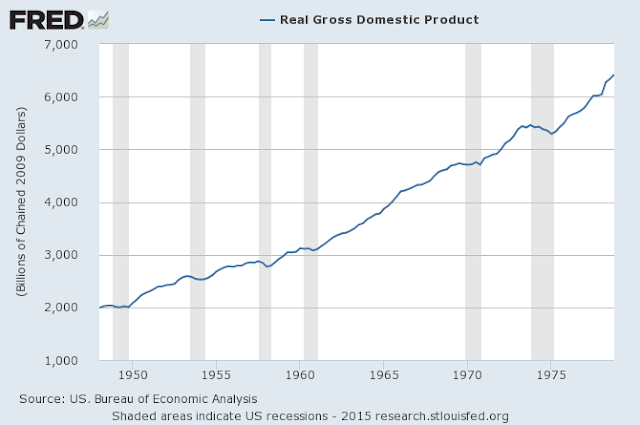 The boom has been very limited and has not reached the economy as much as in previous booms. What do you think a boom is? It is money flowing into the sectors you identified, the capital goods sector, e.g., the stock market and real estate? That IS the definition of a boom according to ABCT. As for your comment on 25-54 participation and "QE not working" that flies in the face of ABCT. QE can't possibly hold ABCT to hold true and say what you are saying. Further, if you claim it is a failure of the Fed (at this stage if the business cycle) that has lowered the 24-54 participation rate then you don't believe in markets clearing. What is your theory that supports the idea that markets don't clear? If look at each group as a percentage of the labor force, look at that groups participation rate and created a weighted average. you can see very clearly that the decline since 2000 is mostly due to demographics. In addition to Isaac's excellent points, in this analysis by Doug Short, he includes the following data. The above data seems to correlate with the claim that Baby Boomers are not leaving the workforce. Is it possible that a not insignificant percentage of the people going to college are doing so just to get the free loans so they can pay rent, as they cannot otherwise find income? Then to make matters worse, you have a decrease in the high participation 35 to 44 group (well over 80% participation rate). So if you view the overall participation rate as a weighted average of those groups, you can see how demographics are pulling down the participation rate. On the ground companies aren't bidding up salaries. They still behave like people should be thankful for the chance to compete for a job and instead are looking for people willing to work more hours for lower salaries. The only big salary increases are on the bottom of the scale and that's coming from applied political pressure. http://www.bls.gov/opub/ted/2014/ted_20140106.htm prime working age expected to fall and expected retirement age coming back into the labor force, yep the boom has really reached everyone. The fed's perspective of QE "working" is that it would benefit the economy as a whole. That's what i'm referring to when I say QE has not "worked", of course it has succeeded in increasing the money supply and thus creating a boom. The economy is crap and businesses know it, which is why they are buying back their stock, laying off employees, and not investing. this chart only goes to 2012, 2015 figures are lower http://www.bls.gov/emp/ep_table_303.htm. Low interest rates work temporarily, until they don't. When sufficient consumer demand doesn't materialize 5-10 years into capital investment, i.e when malinvested capital doesn't garner the return it's artificially low cost signals it will, then businesses and jobs collapse. When revenue is so low even payments on principle can't be made, 0% interest rates do not continue to stimulate. However QE could "work" forever to stimulate a target sector at the expense of all others. It's equivalent to a tax. Just forcibly transferring wealth from all sectors to particular ones destroying wealth and the net productivity of the economy as a whole in the process.